Otter Falls Log Cabin- 3 Bdrm / 3 Bath, Walk to the Beautiful Otter Falls !! The Ultimate Getaway in the Mountains ! The location couldn't be better to explore the High Country !! Restaurants, Shopping within a 10 minutes drive. The quaint little town of Banner Elk is 15 minutes away and Boone is only 20. Stay on site to explore the forest with the adjacent Otter Falls Trail. Pack a picnic lunch and enjoy a 10 minute hike to the Water Falls. Refresh & rejuvenate in the natural surroundings. Ours is a true log cabin offering 2500 sq ft on three levels with three decks to spot the wildlife. The master suite is conveniently located on the main level with a jetted tub in the Master bath and separate Shower. The kitchen Inspires...... with granite counter tops and stainless appliances, open to the dining and living room and perfect for entertaining. The deck off the kitchen looks out over the back of the property with no other house in site. Grill your dinner with the convenience of being directly off the kitchen. Watch for early morning Turkeys while you sip freshly ground coffee on the porch swing as the sun comes up over the trees.....Our personal Favorite ! The living room is nicely decorated in Leather furniture with Mountain accents. Reminisce in front of the gas fireplace with a book and one of our 'oldies' but goodies records. There's a desk on that level to check your emails and work....... if you must ! The top level has 2 bedrooms, with one bathroom. The lowest level of Otter Falls has the Game Room, Laundry, and a separate Theater Room with Surround Sound and Theater Chairs. The game room is Abundant....... with a Pool Table, Foosball and TV & X Box gaming system, along with plenty of books, games, puzzles or get silly with Karaoke ! Step out to the adjoining deck to soak under the stars in the Hot Tub or laze under the trees in the Hammock. The perfect end to the day can be had in front of the Fire Pit, toasting S'mores or challenging the family to a outdoor game of Corn Hole. Otter Falls Cabin is the perfect spot for creating lasting family memories with thoughts to return again and again. Access to the Cabin is paved except for the last eighth of a mile, which is a private road. Four wheel drive or chains may be required when there is ice and snow. Access may not be suitable for vehicles with limited ground clearance. Mountains visible during the winter time only. Basic Pantry Items for your convenience. Spice Rack, Flour, Sugar. Plenty of Serving Trays, Utensils, Gravy boat and all you need to Entertain. Walk to the Otter Falls from the back of this private cabin nestled in the woods, bordering a State Park, so ..No houses. Enjoy the Fire Pit, Hot Tub, Theatre Room, Karaoke and Pool Table. Try Zip Lining, Snow Tubing, Horse back riding & Grandfather Winery within minutes from the cabin. This is an ideal getaway close to beautiful waterfalls, zip lining, hiking and the Blue Ridge Parkway for spring/summer adventures. Susan is lovely and her cabin is cozy, immaculate and quiet. The beds are very comfortable, the kitchen is fully equipped and the game and movie rooms provide countless hours of fun for kids and grownups alike! We would definitely book this cabin again! We loved this cabin from the minute we walked in. The whole process from directions there to checking in to things to do in the area were all given to us prior to our stay which made everything really easy for us. The cabin itself had plenty to do. We loved the “man cave” and the hot tub. I would definitely recommend this place to anyone looking for a fun little getaway. Thanks Susan for lots of great memories at Otter Falls. Great times, great amenities. Everyone enjoyed the trip very much. Loved this great cabin! The owner stocked it very well for a comfortable stay. The beds were comfy, and the location was amazing. We enjoyed the short walk down to Otter Falls every day of our stay. Highly recommend this one, you won't regret it! Otter Falls Cabin is tucked away among the the Rhododendrons and Hemlock trees. Private and Serene, yet within minutes to many local Attractions and Restaurants. Hawksnest Zip Lining and Snow Tubing is one mile up the mountain. The Falls are a short walk down the trail - perfect for a picnic ! 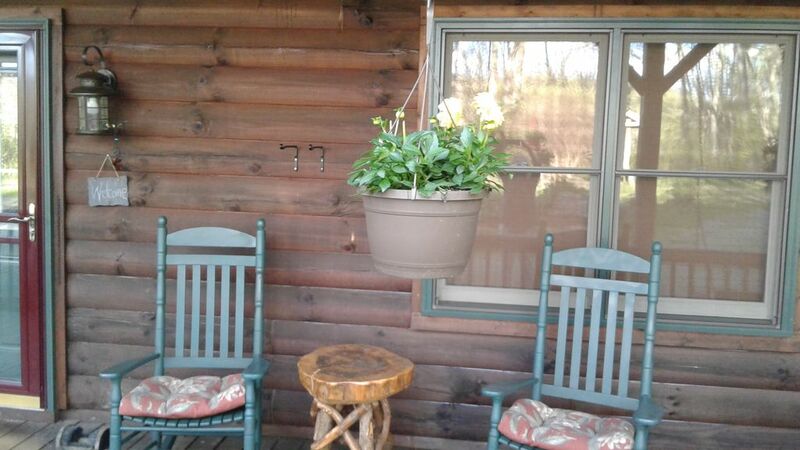 Ski Slopes, Shops, Restaurants, Playground, Tennis, Antiquing, Hiking trails ......all very close to the cabin.